Allow me one more chance to spew forth on Canadian politics. I'll try to be brief, and now that the election is over, all you'll hear from me is some random complaining about the government. Would you expect any less from a sympathetic left winger? Well, I won't say the unthinkable happened. Mainly because it wasn't an impossibility that the Conservatives would get in. Happily for me, it's a minority situation. The liberals have indeed been given their "time-out" for past bad behaviour, as suggested by Jack Layton, leader of the New Democratic Party, and Jack himself has been awarded with greater representation in the House of Commons. I of course voted for my local NDP candidate, who won her fourth federal seat in a row, and this time by a record number of votes. The good news is that, on the policy-operations side of things, not much will change. There won't be enough members of parliament to do anything silly when it comes to law-making or law-repealing. The bad news is that there's a strong possibility nothing at all will get done until there's another election, which could result in the same situation. Unfortunately, as I mentioned yesterday, many of the promises that came out in the campaign likely will not be realised (family allowances for day-care, cut in the Goods and Services Tas from 7%, to 6%, and eventually to 5%). I'm somewhat gratified that there has been some sort of change. I once complained that having forced election after forced election with no substantial changes in government was a waste of taxpayer money. Where elections are mandated due to terms of office being up, I don't mind no substantial change at the helm. I'm also happy that the Bloc Quebecois party will be weakened in the House, and the NDP with the Liberal Party hold some power if they decide to play nice together. So, Stephen Harper and his party get to try their hand at governing: something the Conservatives haven't done since the Mulroney era, 12 years ago. It will be interesting to see what happens to international relations, especially those with the United States. For those people who think that Harper will be the puppy-dog to President Bush, they may learn that as much as he'd like to follow many American policy leads, the Canadian parliament won't allow it. Basically, all the hot-button issues which could have won the Conservatives seats in the house may NEVER be acted upon. It would seem that "those issues which Canadians hold dear to their hearts and because of this voted Conservative" may not have been the real reason there's a change in the power structure in Canada. 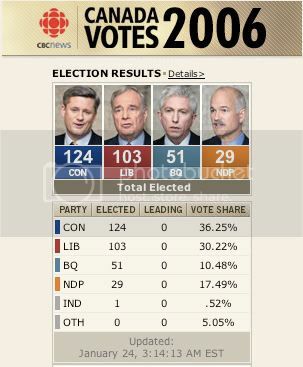 The real reason might be that the Canadian public really did want a change, but just weren't afraid of the Conservatives. 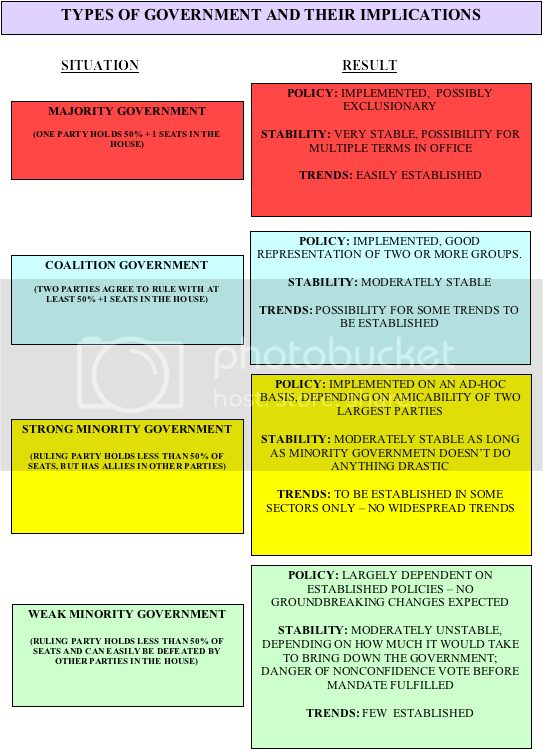 Many people are saying that we'll see a moderate Conservative government for the duration of this term, and into the future until such time as they can win a majority. 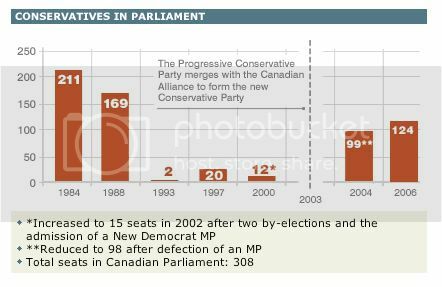 But with the Liberals holding power for 72 of the last 100 years (or somesuch outrageous figure), I wonder what the odds of a Conservative majority would be anytime soon. So, this government would fit into the "weak minority" situation, and I'll be expecting another election within the next year and a half. There, I said it: that's my prediction.Summer/fall 2007, baby! I now return you to your regularly scheduled, important, non-Canadian influenced world. I'm sorry...I wanted to say something intelligent, but my eyes glazed over about 2 charts ago..
Ha ha... if I'd waited until I said something intelligent, I'd still be writing that post. Can't beat charts, though. Admit it! AND original work! That's got to be worth something. Wow...would love to hear your take on AMERICAN politics! oh, the election is just bologney. i have something more important to talk about. lately, i have been wondering why some public washrooms have about 1/2 inch space between doors, for each cabin. it's so stupid and it always bothers me that people can still see others sitting inside. I hope you're right about 2007. Now if we could abolish the Con party entirely, I'd be even more happy. They never worked, since the beginning of Canada, and that ought to be what people realize. i had to drink beer last night. BEER! stupid stephen stupid harper. i may be drunk for the next four years. and yes, thanks for the charts! In case it's not obvious, that washroom comment isn't actually me (the real Chair). The real Chair will always have my little photo. Chair(s): I didn't reply to the washroom comment only because I was looking for a link to those washroom stalls that are totally transparent until you close the doors; then they're frosted glass. Too fun. You'll have to take my word on it now. Echo Mouse: Thanks for the compliment. I try (not to be such a nerd when it comes to analysis sometimes). okey dokey, about my washroom comment again. i sometimes have the tendency of denying what i had just said, so if i say that i didn't write something, just ignore it. i am often confused; thus, the washroom comment is indeed mine. it's mine, my precious!